Some of the building’s historic features made it difficult to achieve LEED platinum, so the project will likely end up with LEED gold. The turn-of-the-century Monterey Hotel will house the Chief Seattle Club and two floors of market-rate loft apartments. It’s on track for LEED gold, with rainwater used to flush toilets, recycled denim as insulation, solar power and a heat recapture system. A vacant turn-of-the-century hotel in Pioneer Square will start a new life next month as a safe harbor for Seattle’s American Indian community and as apartment lofts for urban professionals. Renovation of the historic building on the Second Avenue Extension South near South Washington Street is on track to get the U.S. Green Building Council’s LEED gold rating. The two lower floors of the former Monterey Hotel will provide a permanent home for the Chief Seattle Club, founded more than 35 years ago to provide services, treatment and a resting place for Seattle’s American Indian community. The top two floors will house 11 market-rate, loft-style apartments. They will have a separate entrance and elevator, and panoramic views of the neighborhood. Jones and Jones Architects and Landscape Architects redesigned the 12,000-square-foot building to reflect traditional American Indian culture and beliefs. General contractor was Walsh Construction. Eleven loft apartments ranging from 600 to 1,820 square feet were designed to attract urban professionals. The units have exposed steel framing, Energy Star appliances, and balconies that look out on SoDo and Smith Tower. The new club will open its doors to Seattle’s 50,000-plus American Indian and Alaskan Native population on Dec. 6 with a blessing ceremony, including a celebration by Duwamish drummers and dancers. The project follows years of work to raise money for building the club, which is currently housed in three different rented spaces. 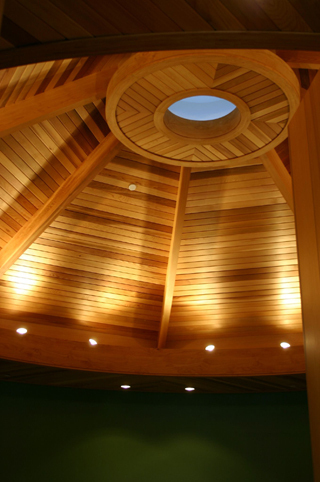 A gathering area with a circular cedar ceiling, traditional adzed wood paneling and circular alder seating will welcome people to the club, reflecting the importance of the circle to native people, Jones said. It will also feature art donated by American Indian artists. Designers looked at books of Northwest tribal masks to help develop the club’s color scheme of bright greens and reds, earthy browns and yellows, and thick black moulding and detailing, according to project manager and project architect Dave Matthews. The design also includes space for tribal gatherings and for club members to work on arts and crafts. It also has a laundry area, showers and a cafeteria to serve the largely homeless population. Private rooms will provide space for substance abuse treatment and counseling services. The Monterey Hotel was built in the early 1900’s. In 2001, after the Nisqually earthquake, Steve Trainer of the Seneca Real Estate Group and his wife, Tricia, who are longtime board members at the Chief Seattle Club, purchased the building for about $600,000, cleaned it up, and donated it to the club. The club launched a capital campaign to pay for the renovation, with a goal to raise $5.4 million. The building was badly damaged by the earthquake, and needed a new steel support system. Structural engineer was Lund & Everton. Donations included $750,000 from the Bill and Melinda Gates Foundation, and $250,000 each from the Norcliffe Foundation and the Paul G. Allen Family Foundation. The Trainers kicked in an additional $1 million, and the club received a $350,000 grant from the state and $300,000 from the city, said Trainer. Indian artists donated artwork and crafts to decorate the space. Architect Steve Romein and his wife, Ty Cramer, who are also involved with the club and philanthropy, got on board. They purchased the top two floors of the building for apartments, and donated that money to the capital campaign. Romein and Cramer also paid for a green retrofit of the entire building, which will likely save the club about $10,000 a year in energy costs. Romein and Cramer have remodelled their own 1920’s Madrona home to include solar panels for energy and hot water, and hoped this apartment building, their first, could be LEED platinum. But some of the historic features of the building made it difficult to achieve platinum, so the building will likely end up with a LEED gold rating, Matthews said. Jon Heller, lead mechanical engineer with Ecotope, said he provided Romein with a list of energy-efficient systems that could be included in the design, expecting him to choose a few. Romein chose them all. Emerald Aire provided the design-build HVAC system. Rainwater captured on the roof will run through all of the building toilets and through spigots on the decks. Solar panels atop the building will send heat to storage tanks that will supplement the boiler, and coils beneath the showers in the apartments and club will re-capture 30 to 50 percent of the heat and send it back to the system. Walls were re-insulated with recycled denim fiber and more than 80 percent of the waste from re-construction was recycled or re-used. Materials were gathered from within a 150-mile radius of the city, hardwood floors in the lofts were made with bamboo, and countertops are made of a renewable wheat-based laminate. Light-walls were installed, drawing natural light into the club’s lower floor, which is below ground. Jones said the sustainability features make the space consistent with Native American beliefs and with traditional homes, which always sought to have little impact on the earth. Romein said they originally planned to house low-income apartments above the club, but didn’t have enough units to meet the threshold. There will be 11 loft-style studios and one-bedroom apartments, ranging from 600 to 1,820 square feet and designed to attract urban professionals. The Monterey Lofts have exposed steel framing, Energy Star appliances, and balconies that look out onto SoDo and Smith Tower. 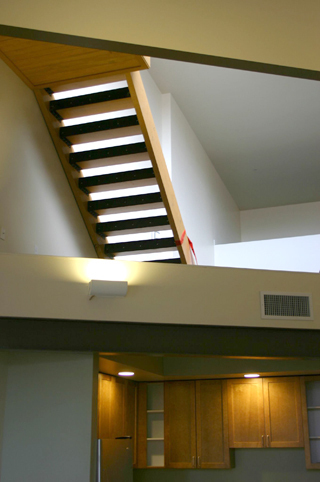 One-bedroom units are two levels. Rents have not yet been set but will range from about $1,000 to $2,500 a month, Romein said. Romein and Cramer have agreed to keep the space as rental units for at least five years. The building is in an area historically with high crime rates. 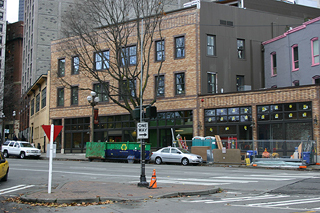 The project follows other recent developments in the neighborhood, including the 14-story Fortson building at Yesler and Second, and the Masin Furniture renovation at Second and Main. Romein said he hopes the apartments will add to the revitalization effort.